Calling cards of siblings Ina M. Swift and Eddie L. Swift of Sidney, Maine. Ina married in 1888 so her calling card, if not also his, date to before that year. Ina M. Swift and Eddie L. Swift were the children of Rufus Swift and Clara E. (Jones) Swift of Sidney, Maine. Ina was born about April 1869 and Eddie about July 1871. 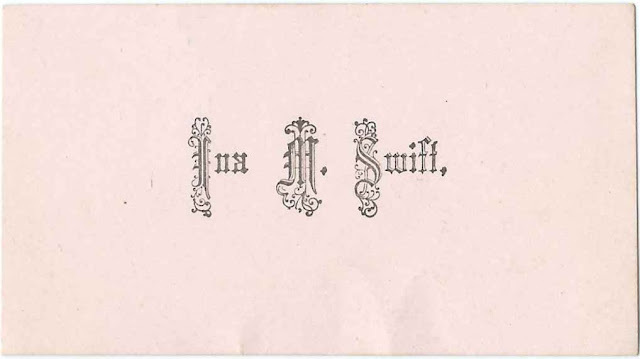 Ina M. Swift was born about April 1869. On March 15, 1888, possibly at Sidney, Maine, Ina married Bertelle L. Taylor, "Bert", son of Nathan W. Taylor and Emma Caroline (Turner) Taylor. Ina and Bert farmed at Sidney, Maine, and at Farmingdale, Maine, and had at least one child, daughter Emma Clara Taylor, who married Elmer F. Tillson in 1915. Ina died in 1933 and Bertelle in 1947. They're buried in the Village Cemetery at Hallowell, Maine. 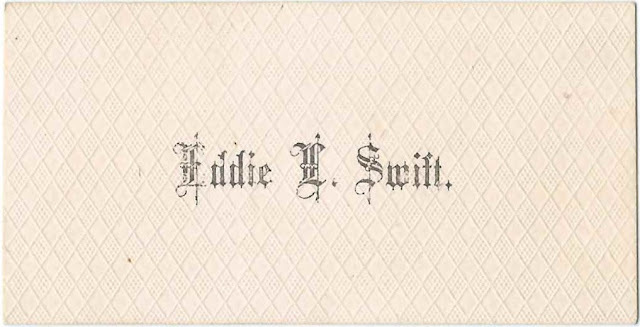 Edward L. Swift, "Eddie", was born about July 1871. On November 14, 1897 at Sidney, Maine, Edward married Ella May Trask, daughter of James H. Trask and Hannah M. (Hawes) Trask. Edward and Ella lived farmed at Sidney, Maine, and raised several children. Edward died in 1943 and Ella in 1962. They're buried in the Cowan Cemetery at Sidney, Maine, with many relatives.